Japanese gamers can now pre-order a limited edition Metal Gear Solid V PS4, but what about the rest of the world? While the franchise didn't get its start on Sony consoles, the Metal Gear games have maintained a strong allegiance with the PlayStation brand dating back to the franchise's resurgence with Metal Gear Solid. Put shortly, while Metal Gear has gone multi-platform on several occasions, for many gamers PlayStation is probably still one of the first names to come to mind when thinking about the series. Perhaps hoping to further cement that link, Sony and Konami have recently unveiled a new limited edition PS4 that will feature imagery from Metal Gear Solid V: Ground Zeroes. More specifically, the special PS4 will come with a unique Fox Unit decal positioned over the console's glossy portion. The limited edition is currently slated for a March 20th release, though sadly only in Japan. 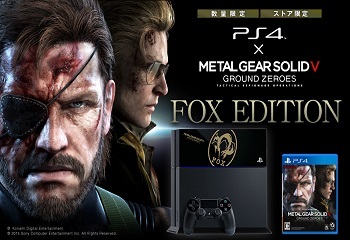 It will come packaged with a retail copy of Ground Zeroes and can be pre-ordered for 46,980 yen (about $460) at the Japanese Sony Store. The big question, of course, is whether or not territories outside of Japan will be receiving an equivalent version. Granted, it's not like the PS4 really needs much help selling these days, but a Metal Gear emblazoned edition could serve as fodder to convince on-the-fence franchise fans to pick the new PlayStation over the Xbox One. Granted, the recent revelation that Ground Zeroes will run at a higher resolution on the PS4 could be enough to do that on its own. Even so, it'd be hard to find a good argument against bringing this to western markets. What do you think? Does this limited edition look like a must-buy for you?